The anthem for the Great Recession might be something along the lines of, “That we’re gonna do it anyway, even if doesn’t pay.” Some men just want to watch the world burn, so Hackerbot Labs posted a great walkthrough about shrinking coins and in the process making our pocket change worth just a little bit more. Their build pushes 15,000 Joules (from a 10kV 300μF cap) through a coil of wire wrapped around a coin. This creates a magnetic field in the coil and the coin. These two fields repel each other, and there’s only one way that it can end: the coin shrinks and the coil of wire explodes. The team at Hackerbot Labs linked to a great theory of operations that does a great job explaining the physics has some awesome pictures. During our research, we saw a few questions about the legality of altering currency. 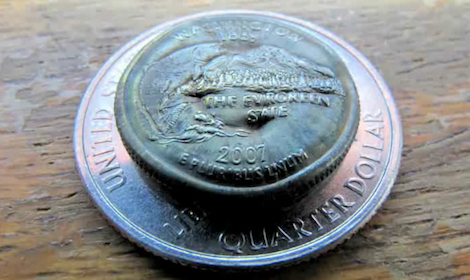 According to the U.S. Code, shrinking coins only illegal if it’s done fraudulently, like shrinking a penny down to the size of a dime to fool a pay phone or vending machine. Check out a video of the Hackerbot Labs setup putting as much energy as 100 heart defibrillators into a coin after the break. Photonicinduction tried this recently – failed because he needs more power! yeah because when merchants no longer accept it, it becomes more trendy and kewl..then people like Johnny Depp will buy it from you. You misinterpreted the statement. The destruction of the coin makes other coins more valuable. Also, 10 foot science poles FTW. FYI according to the website http://www.ramint.gov.au/designs/ram-designs/using.cfm Defacing and or Destroying Australian currency is illegal and can attack fines of $5,000 and 2 years in prison for individuals. Apparently you can also be charged with counterfeiting money if you alter it, They then go on to quote some random act of the copyright that could be infringed upon because of alterations. Lucky it was only a US quarter dollar and not Austrian money. I hope you have never left any Austrian notes in your pockets and put then in the washing machine. 2 years in prison and a fine of $5,000 for damaging your own money dose seam a bit surreal. It’s not our money. We only own it’s alleged value. The money remains the property of the country of origin. I think the same law applies to all commonwealth countries, right? It is illegal to deface any US currency. However, the supreme court ruled that persons do not have to accept pennies for payments of debts, and therefor, they are not technically currency. This is why those penny crusher machines are legal. As a (not very serious) coin collector, I’d have to disagree. Most collectors want rare coins in perfect original condition, rather than smashed with 15kjoules. The engineer/scientist in me would love it though!~ Just be sure to tell me how you did it. They only introduced 1/2 penny coins in February 1971. That means that I am ancient as I was born before 1971. I don’t know what your source is, but there have been British Half pennies since the 1100s. How many Farads was that cap? Uh, didn’t you cover this in 2008? I even had the article printed out. Oh wait, the article only linked to it.